It's organic lemon season once again. I decided to try a British Version as well this year. Maybe I've been watching too much of the Great British Bake off, or maybe my Anglophile tendencies just caught up with me. After all, Marmalade is a classic British product. Once created to prevent scurvy on long journeys, marmalade became a fashionable part of the classic Afternoon Tea. For me, it is all about the contrast of puckery tart peel with sweet set jam that makes me whip out the jam making pot as soon as I find the first organic lemons in my local shop. Why Organic? When you are eating the peel of the fruit, you really don't want to be ingesting a big old hit of pesticides, herbicides. Those chemicals store with the fats in the peel. And you can't eliminate them by scrubbing. So wait till you have organics and then have fun! Nutritionally, marmalade has a massive amount of bioflavonoids, more than any juice. 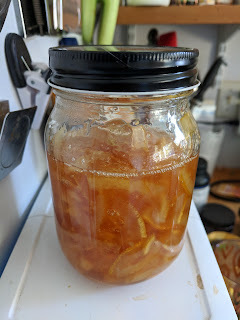 Now, even though it is better for you than many jams, remember that marmalade is half sugar. Why so much sugar? You need this amount to get the water from the cooking and the pectin released from the peel to jell. So what is the difference between the two types of Lemon marmalade? Cooking technique and water content are the two differences. American Style Lemon Marmalade starts from fresh ripe lemons, slices them paper thin using a mandoline, then macerates the slices with water and sugar overnight before cooking and jarring. British Style Lemon Marmalade cooks the lemons whole till tender, then chops and seeds the lemons, reserves the pips (seeds) and then proceeds to add the sugar and cook. When the lemons get weighed after chopping, they weigh more. The amount of sugar is equal to the weighed lemons for both types of marmalade. Effectively the British version is sweeter, since the lemons absorb so much more water while they are cooking. I also noticed that the lemons were much darker in color after absorbing the water, not off putting but not as pretty as the bright lemon yellow of the American version. 1. Slice lemons very thinly using a mandoline or sharp knife. 2. Weigh lemons and add an equal weight of sugar and 1/2 weight of water. 3. Cover and let sit overnight. 4. Cook till the mixture in stockpot reaches 218-220°F or till it gels on spoon. Now click on through to the British Version to see which you prefer.